Reigning and defending ONE Bantamweight World Champion Kevin “The Silencer” Belingon and Bibiano “The Flash” Fernandes will meet for a third time at the Ryōgoku Kokugikan on 31 March at ONE: A NEW ERA in a rubber match for Belingon’s bantamweight strap. “The Silencer” first challenged the Brazilian back in January 2016 for the title, but failed in his bid to capture gold as he was forced to tap in the first round via Kimura. Belingon refused to accept his fate, so he began the long journey back to the top by winning six straight bouts against the promotion’s top contenders. Belingon’s streak earned him another chance to meet Fernandes in a rematch last November, and this time, his hard work proved enough for him be crowned the undisputed ONE Bantamweight World Champion by a razor thin margin. “It feels good to be on such a nice little win streak. It just goes to show that my hard work and long hours at the gym is paying off. That’s all we really want out of training, is for the hard work to show,” Belingon said. Belingon is not taking this trilogy bout lightly as he clearly recalls how the AMC Pankration representative gave him one of the most unforgettable 25 minutes of his life. This made Belingon respect and acknowledge his opponent even more. “I have all the respect in the world for Bibiano,” Belingon said. 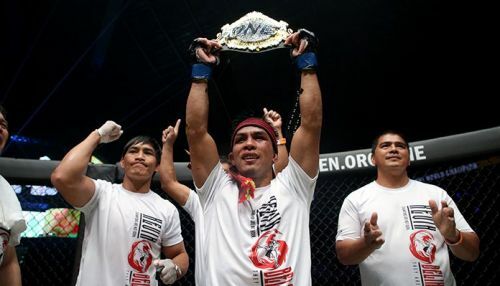 Belingon is confident he can defend his ONE Bantamweight World Title successfully. This is the result of hard work and sacrifice for the past three years. But “The Silencer” knows all too well that this match will be the toughest of all their encounters so far. After all, Belingon is about to face a legendary World Champion whom he holds in high regard. “Everything that I got, I had to work hard for,” Belingon concluded.